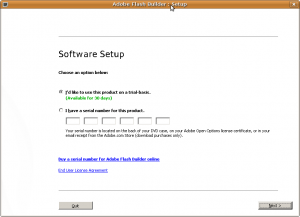 Lately, I’ve been wondering how to use Flash Builder on Linux. 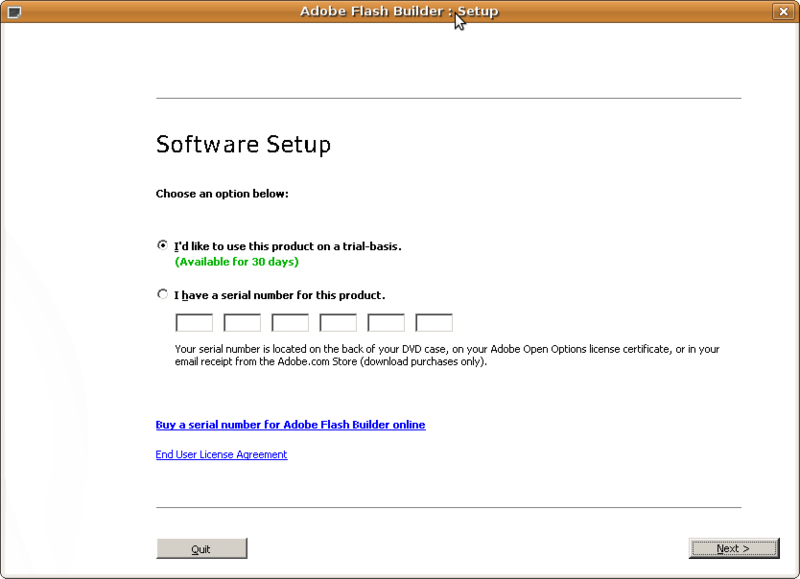 You know, Adobe is apparently putting Flash Builder (formerly also known as Flex Builder) for Linux on hold. 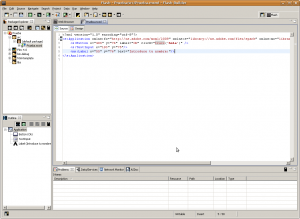 So, if you are a Linux user, you’d better look for alternatives to FB (and certainly, there are a few...) However, I think that FB is the most feature-packed IDE for Flex development. So, how could we use that tool in our beloved system? 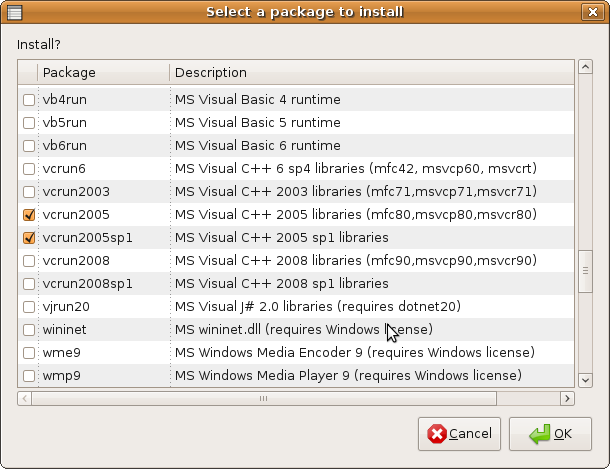 Well, I managed to install it using Wine 1.1.23 on Ubuntu 9.04. This is the process that I’ve followed. 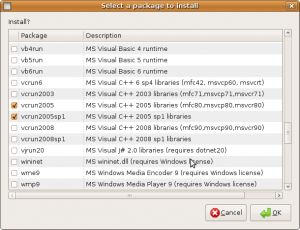 Now, you must select vcrun2005 and vcrun2005sp1 to install the needed dependencies : MS Visual C++ 2005 libraries and the related service pack. Voilá! After entering the Serial Number or choosing the trial version, you’ll be able to work with Flash Builder on Linux 🙂 Enjoy! Note: don’t forget to visit the WineHQ AppDB page about Flash Builder, for learning some hacks&tweaks that will allow you to address some annoying issues with code completion and the use of spaces as tabs. Great guide! Thanks for your contribution. I don’t have an HKEY_LOCAL_MACHINESOFTWAREAdobe entry in my Windows registry after installing, but I do have HKEY_LOCAL_MACHINESYSTEMCurrentControlSetServicesFLEXnet Licensing Service. 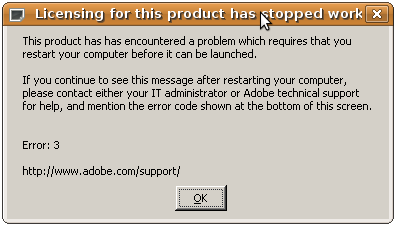 Unfortunately, transferring only this entry doesn’t seem to stop the «licensing error.» Any ideas, or way that I could get a copy of your adobe.reg? (I’m not sure what’s in there, so if it’s in any way sensitive information, don’t worry about it). An additional note: now that I think about it, it’s probably related to the fact that my Windows installation is 64-bit. @Timothy: unfortunately I don’t have a 64-bit system to test. Have you tried to search the SoftwareAdobe branch through the registry? my adobe.reg copy. Now that I’ve read it thoroughly it seems to me that it only has Acrobat Reader related information, so it’s harmless, and it could be an extra file that certainly is not needed. I fixed it! As I suspected, it was the result of my Windows installation being 64-bit: Flash Builder being a 32-bit program, it gets installed into «Program Files (x86)» in Windows. Thus, the FLEXnet registry entry pointed to «C:Program Files (x86)Common Files….» and needed to be corrected. Thank you for uploading your file; I can confirm that it is indeed superfluous and not relevant or necessary to get Flash Builder working. The only steps needed are to copy the Common Files and flexnet.reg to WINE. One thing I would add to your (excellent) guide: I did need to install comctl32 (in addition to vcrun2005sp1) using winetricks as per the WINE AppDB page; otherwise, the program crashes after the licensing screen. Thank you again for your contribution to the WINE community! An excellent post. my windows registry are different than your case? can u come up with any solution also for me ? I too was running Windows 7 and it worked for me. Copy the files in Common Files/Adobe and Common Files/Macrovision (as documented) and the registry entries from HKEY_LOCAL_MACHINESYSTEMCurrentControlSetServicesFLEXnet Licensing Service; install vcrun2005sp1 and comctl32 using winetricks. The only caveat is if your Windows 7 installation is x64; then, you should look under Program Files (x86)/Common Files and you will need to slightly modify the FLEXnet Licensing Service entry. 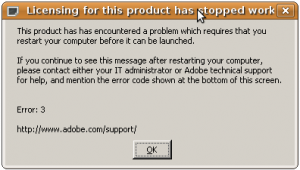 !MESSAGE An error occurred while automatically activating bundle com.adobe.flexbuilder.ui (223). org.osgi.framework.BundleException: Exception in com.adobe.flexbuilder.ui.UIPlugin.start() of bundle com.adobe.flexbuilder.ui. can someone help me to locate the error ? I’ve followed this guide with no success. First of all, the flash builder installation return the message «could not create java virtual machine», but if I install the sun jre, it don’t works. Any idea? currently i am using Flexbuilder3 IDE .already flex 3 is installed in my system.can i install flash builder 4 also in the same operating system?will it make any problem?whether i need to uninstall my flexbuilder 3?.Please let me know comments.I am using windows 7 as operating system. The FB port for linux on http://code.google.com/p/fb4linux/ works great! Installation instruction here: http://www.brighthub.com/hubfolio/matthew-casperson/articles/78818.aspx are awesome! Siguiente Entrada siguiente: ¿Software libre, abierto u open source?